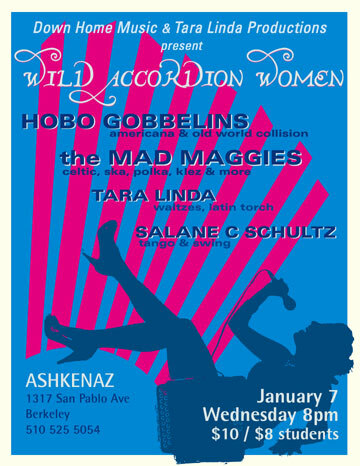 We are pleased to be part of this crazy accordion babes night at Ashkenaz in Berkeley! Salane & Friends (Tango & Swing) start off at 8pm and are followed by Tara Linda (Jazzy Blues, Latin Torch). We take the stage at 9pm then it’s the Hobo Gobellins – (Old Time Vaudeville).